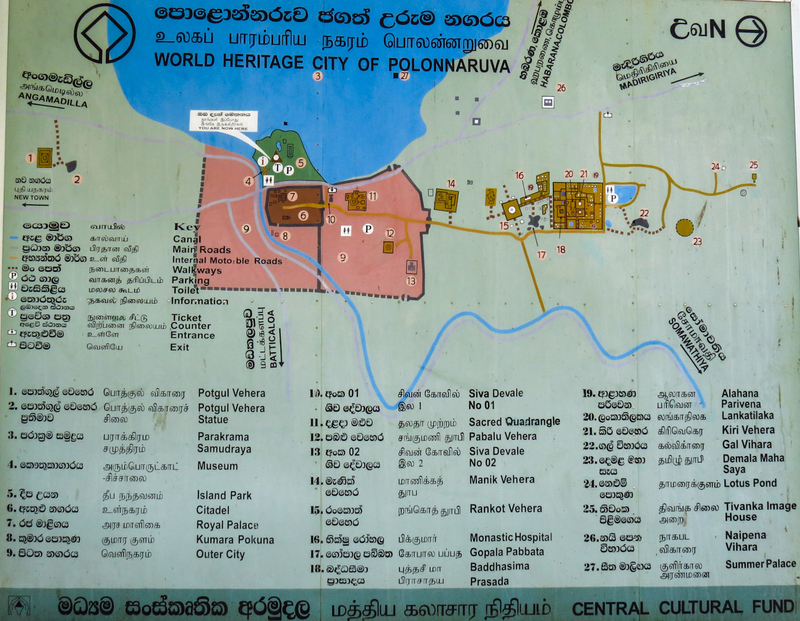 Polonnaruwa was an important city long before the 10th century, when the invading Cholas made it their capital. It became the national capital from around 1070 AD, when King Vijayabahu I (1055 - 1110) expelled the Cholas from the island, until 1215, when the city fell once more to Tamil invaders. The greatest king of Polonnaruwa was Parakramabahu I (1153 - 1186), who created the great reservoir; his reign is considered to be the Golden Age of Polonnaruwa. The walled capital city, comprising secular, sacred, and residential districts, is located on the eastern bank of the enormous Lake Parakrama, an artificial reservoir; its perimeter walls measure over .5 km by 1 km (see map at left). The portion of the archaeological area shown on the map, from Potgul Vihara in the south to Tivanka in the north, is about 4 km long by 1 km wide. The full archaeological area, not all of which has been excavated, extends beyond the map boundaries; Jayasuriya, p. 69, quotes dimensions of 5 km by 3 km for Greater Polonnaruwa as a whole. During the medieval period, Polonnaruwa absorbed many cultural influences from South India related to Mahayana Buddhism (Gal Vihara), Hinduism (Hindu Shrines), and architecture (Lankatilaka). Polonnaruwa was the capital of the Chola invaders from 993 AD until their expulsion in 1070, and it was not uncommon for Tamil and Sinhala elites to intermarry. Another significant trend during this period was the expansion of trade, with goods from India, China (porcelain), SE Asia, and even Persia finding their way into the Polonnaruwan kingdom. The pages that follow, progress from south (Lake Parakrama and the Potgul Vihara) to north (Tivanka) as per the site maps (left, and below).